How do you replace a legend? That's the question the Oregon Bach Festival faced a few years back when founding artistic director Helmuth Rilling announced he'd be retiring in 2013 (when he would turn 80) from leadership of the world-renowned institution he and Royce Saltzman, a professor in the UO School of Music and Dance, created in 1970. Over the course of those years, the festival had grown from a small workshop for choral conductors and organists to one of world's greatest classical music gatherings. Now it was time for that most delicate of operations: a smooth transition from a charismatic founder to a successor with a different vision to suit different circumstances. This transition is especially important to Rilling. "I think the most impressive thing we've had over the years is the continuity," he says. Maintaining that continuity wouldn't be easy. Because the Bach Festival is a university institution, Rilling himself could no more play a role in choosing his successor than could any dean or president. But change was in the air. In the decades since Rilling had come to musical maturity, Baroque music had been revolutionized by new scholarship that resulted in historically informed ways of performing the music of Bach, Handel, their contemporaries, and even later composers like Mozart. Several generations of performers and conductors have adopted the use of period instruments as well as tunings and performance styles close to what the composers intended (generally referred to as historically informed performance or HIP), resulting in more agile and expressive interpretations. 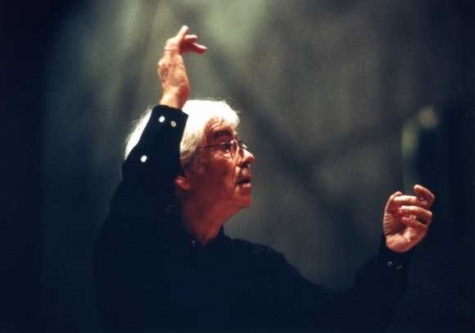 Meanwhile, although his approach evolved significantly over the years as well, in many ways, Rilling continued to embrace the mid-20th-century style featuring modern instruments, choral forces far larger than the composers would have known, and other techniques that, by the beginning of the 21st century, most major Baroque interpreters had left behind. Maintaining continuity while effecting change seemed a tricky balance. "If we didn't change it enough, that would just be trying to replace Helmuth, and that would never work," says UO senior vice president and provost James Bean. "If we changed it too much, we'd lose that heart of what made Helmuth's festival what it was." Fortunately, the university had an important advantage in negotiating a delicate course. The search would be led by the festival's executive director John Evans, a former BBC executive who filled the post when Saltzman became director emeritus in 2007. "We were lucky to have John, who was so well connected internationally, to be able to pull this off," Bean explains. "First, he communicated with Helmuth and other close friends of the festival to determine what values had to be maintained, and then where there was room to grow and try new ideas." Crucially, Evans kept Rilling informed throughout the process. And when, in 2011, the festival announced the choice of British conductor and Baroque keyboard specialist Matthew Halls as Rilling's successor beginning in 2013, the value of that preparatory work became evident. The leader of England's Retrospect Ensemble, the 35-year-old Halls clearly represented a new—or rather old—approach to Baroque music. Skilled and engaging, Halls had grown up with historically informed interpretations and had performed on period instruments with some of the legends of the genre, including Monica Huggett, the English violinist who leads the Portland Baroque Orchestra. Evans, in fact, had begun preparing the way for a transition to the now-standard style of Baroque interpretation by bringing Huggett's group into the Bach Festival. And the two-year overlap between Halls's selection and Rilling's departure gave festival audiences a chance to gradually adapt to the new sound. A Portland performance at the Arlene Schnitzer Concert Hall during the 2011 festival (only weeks before the choice of Halls as the new director was made public) featured a sort of baton passing, with each conductor directing half the performance. "It's been reassuring for Rilling to be able to see Matthew conduct Mendelssohn, Bach, Tippett, and others at the festival," Evans says. "He can feel the festival is in safe hands." Last summer at the UO's Beall Concert Hall, Halls performed some of Bach's keyboard concertos in a HIP chamber setting, while Rilling led orchestral performances of some of the same works using modern instruments. Each attended the other's concerts. This year's Bach Festival will include a Passing of the Baton concert July 6 at the Hult Center in Eugene when Rilling and Halls will take turns at the podium conducting Brahms and Mendelssohn; Halls will conclude the program with Brahms's Schicksalslied, "Song of Destiny." "This transition has gone in a very natural way," Rilling says. "I'm glad Matthew was interested in this position. The beautiful thing is that he comes from the same musical tradition. You can say in some ways he has the same musical faith." While noting that the festival henceforth will indeed see a greater presence of period instrument players in residence, Halls finds unexpected commonalities between his approach and Rilling's, despite their different generations and backgrounds. "It's not as simple as saying Helmuth represents a particular school of interpretation and I another," he explains. In listening to Rilling's performances, he says, "I'm constantly fascinated by the extent to which Helmuth has arrived at some of the same answers to questions about the music as I have. To preserve the integrity of a performance, I have to be honest to myself. But I'm a product of all sorts of influences on me—including the music of Helmuth Rilling." Another sign that the transition from Rilling to Halls may be equal parts continuity and change lies in their top priority for the festival itself—and it's not, as might be expected, the many memorable concerts or premieres of new works. In fact, it's not about performance at all. "The activities which we have had in Eugene these many years are twofold," Rilling explains. "On one side we have had wonderful concerts, tours, performances at the Hollywood Bowl, and so on. But the most important thing for me personally and for the idea of our festival is the teaching. Thousands of people have been taught choral conducting in Eugene. The conducting class over the years with so many conductors gave the Oregon Bach Festival great influence on the choral musical life of the United States. 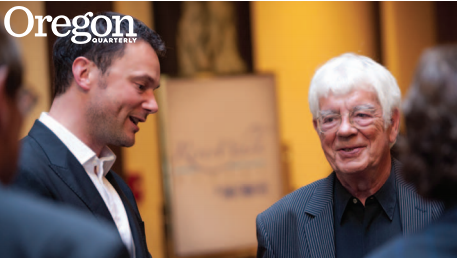 This is one of the most important facets of the Oregon Bach Festival." Halls, too, emphasizes education as the most exciting part of the festival's future. "We shall be announcing some major educational initiatives, including an entirely new course centered on the organ music of Bach," he says. He also says fundraising is underway for a prestigious orchestral academy similar to the European Baroque Orchestra. By "attracting the best students and supporting the post-OBF careers of young conductors around America," Halls explains, "We are ensuring the long-term health and future of our festival." So while the Bach Festival will evolve under its new director, it seems likely to retain much of its character, particularly as an educational institution. "We have already had many conversations about the programs of the future," Rilling says about Halls. "I think there will be a lot of continuity between what happened in the past and what will happen in the future." 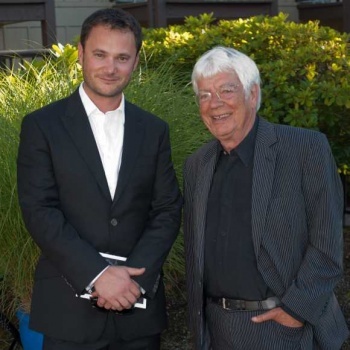 That includes Rilling's continued appearances in Eugene during the summer. "I will stay connected with the festival," he says. "I will conduct and teach at the festival in years to come." He'll also continue guest conducting around the world; this year alone, he's conducted in Moscow, Warsaw, Los Angeles, Milan, Budapest, and beyond. "I'm very grateful that I'm strong enough to do that and my work is appreciated," Rilling says, "and I hope this will also continue in the future as long as I am able to do it." Halls, meanwhile, is looking forward to the shared concert this summer during the farewell celebrations for his predecessor. "I can't think of many occasions when the outgoing director has offered to pass the baton in the middle of a concert," he marvels. "We will relish Helmuth's continued presence, and we will always find a place for him at the festival."